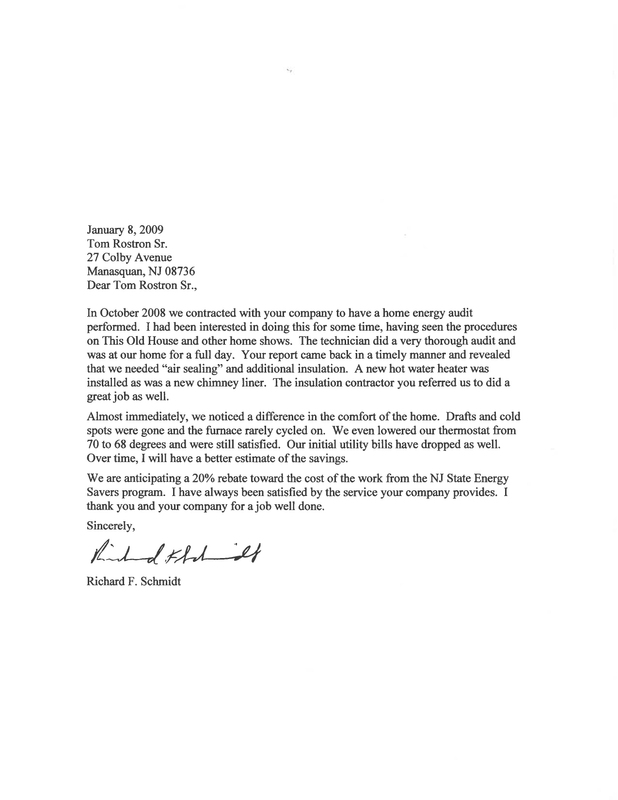 In October 2008 we contracted with your company to have a home energy audit performed. I had been interested in doing this for some time, having seen the procedures on This Old House and other home shows. The technician did a very thorough audit and was at our home for a full day. Your report came back in a timely manner and revealed that we need “air sealing” and additional insulation. A new hot water heater was installed as was a new chimney liner. The insulation contractor you referred us to did a great job as well. Almost immediately, we noticed a difference in the comfort of the home. Drafts and cold spots were gone and the furnace rarely cycled on. We even lowered our thermostat from 70 to 68 degrees and were still satisfied. Our initial utility bills have dropped as well. Over time, I will have a better estimate of the savings. We are anticipating a 20% rebate toward the cost of the work from the NJ State Energy Savers program. I have always been satisfied by the service your company provides. I thank you and your company for a job well done.